There is a newspaper clipping taped to one of our earliest interment books for Historic St. Agnes Cemetery, Menands that gives a detailed account of the death of a well-known and much respected estate attorney affiliated with the acclaimed architect Marcus T. Reynolds. His name is William Duffy Morange. Mr. Morange was more than an ordinary attorney. It was widely known that Morange enjoyed writing prose and verse more than legal briefs. He had quite a reputation locally and abroad though he was modest and insisted the bulk of his work remain unpublished until after his death. His poem, “The Plague”, written after a horrific cholera epidemic, has been reprinted in at least ten foreign languages. His contemporaries would surely agree he was a man of keen intellect respected in both the realm of legal and literary arts. 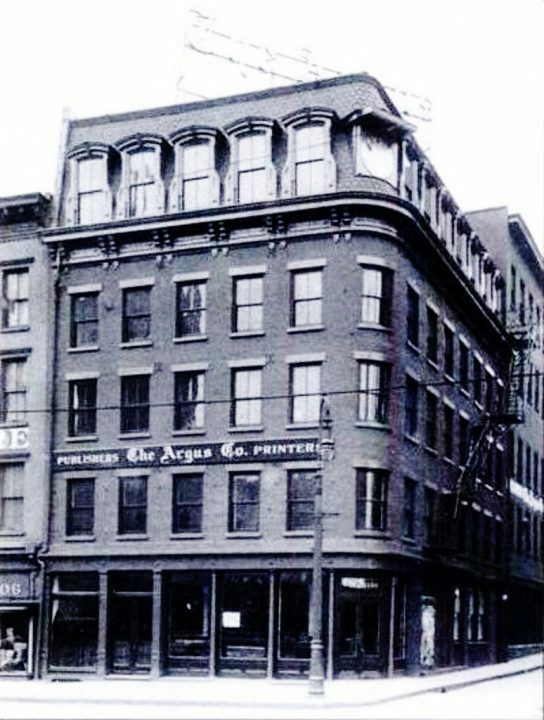 His life as a gentleman and a scholar was well lived until he died in the Argus Building in Albany on November 4, 1895. On turning to leave the editorial rooms on the third floor of the Argus Building, a place he visited several times a week, Morange mistook the door opening in the freight elevator shaft for that leading to the stairway and pitched down the shaft to the cellar forty feet down. A reporter’s account of the accident is as agonizing as Mr. Morange’s final minutes. Among other gory details the reporter writes Morange lay groaning on the floor of the elevator shaft; his body twisted and broken so badly that death was expected. He was taken to the City Hospital and died within an hour. The sixty-five-year-old was unmarried and survived by two brothers and two sisters. Mr. Morange was the FOURTH victim of the Argus elevator shaft and the SECOND to receive fatal injuries. The door leading to the elevator from the editorial rooms is marked, but its proximity to the leading staircase causes the mistake. THREE victims and nothing was done before a good and gentle man met with his death? Can you imagine that happening now? I understand historians should never judge the past in the context of the present, but I can’t help thinking someone really dropped the ball on this one. Shortly after reading about this terrible accident I went up to the grave to see how William D. Morange was memorialized. To my dismay I found no reference of him on the family monument and no marker on his grave. The lot was purchased by he and his brother Pierre and it consists of forty graves filled with Duffys, Duanys, Colvilles and Moranges with the last burial made in 2002. Out of curiosity I did some research on the family and what I found is the makings of a novel ripe with political intrigue, exotic foreign affairs, government corruption, suspicious deaths and mayhem. I would love an opportunity to speak with descendants of Pierre Morange and especially those of his daughter Anna, wife of Cuban exile Pablo Duany. Anna was nearly 20 years younger than Pablo when they married in the Immaculate Conception Cathedral in June of 1858 in the presence of 3000 spectators. Who was Pablo Duany? Where did his wealth originate? How is it that he ended up in Albany? Pablo and Anna had many children before he died at age 55 in 1872. Most of them met with untimely deaths as well, including their sons the devilishly handsome Octaviano and Pablo Duany who suspiciously drowned in the Hudson River together in 1886. It is said there was a cousin with them when their canoe was swamped. Could it have been the bad cousin who was arrested once for stealing $16,000 from his uncle Pablo and again for stabbing his own fiancé in the back – literally? I wonder if the drowning of the athletic young Duany brothers was really an accident. Such a wise and thoughtful man should not have opened a door by mistake and plunged into a dark elevator shaft to his death, but he did. We can breathe life into his story. I think there is a lot more to learn about William Duffy Morange and family – a whole lot more. This is one of the first posts of our “Stories of our Dearly Departed series that will be highlighted from time to time on Albany Diocesan Cemeteries’ Blog, Facebook page and in our newsletters. We hope you enjoy the stories and research that is brought to light on those who are buried within our 18 cemeteries. Thank you so much for your writing, I was thrilled to read a story about my family! William Duffy Morange was/is my 1st cousin 4 times removed, his grandfather William Duffy/Duffey was my 4th great grandfather and he is also buried in the Morange/Duffy family lot. In this last year I have been trace this side of my family and have found a lot of fascinating information about the Duffy’s including that William Duffy Sr used to hold church in his home prior to St. Mary’s being built. William Duffy Jr., who is also buried in the family lot, was an actor and joint manger of the Arche Street Theatre in the late 1820’s-early 1830’s, until his murder in 1836 at the age of 36 by one of the actors working for him! If any of this is of interest to you please feel free to reach out to me! We’re so excited to receive your reply! Kelly Grimaldi will definitely be in touch soon and we look forward to posting an update feature on your relatives!